Of the 1,914 HCPs surveyed, 414 reported ILI. Of these, 183—or 41.4 percent—reported working for a median duration of three days while experiencing influenza-like symptoms. 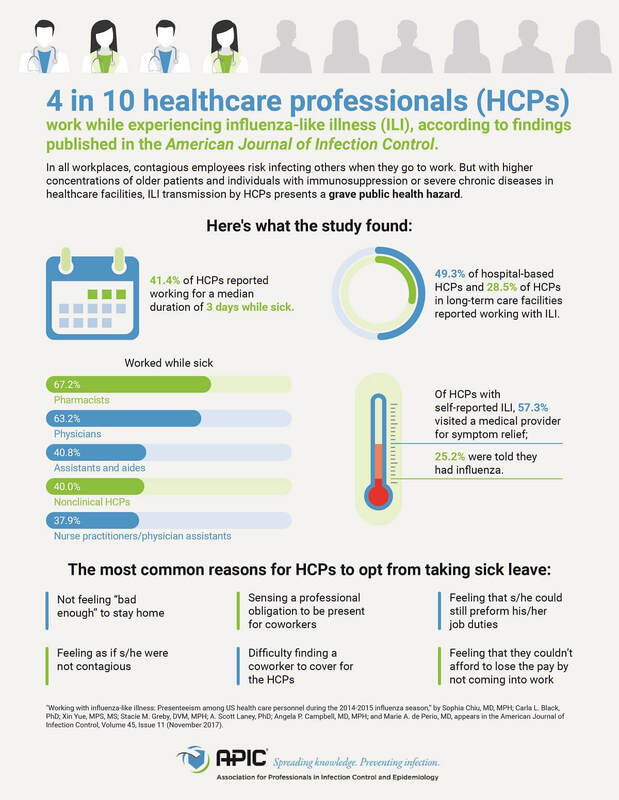 The article is “Working with influenza-like illness: Presenteeism among US health care personnel during the 2014-2015 influenza season,” by Sophia Chiu, MD, MPH; Carla L. Black, PhD; Xin Yue, MPS, MS; Stacie M. Greby, DVM, MPH; A. Scott Laney, PhD; Angela P. Campbell, MD, MPH; and Marie A. de Perio, MD (https://doi.org/10.1016/j.ajic.2017.04.008). It appears in the American Journal of Infection Control, volume 45, issue 11 (November 2017) published by Elsevier.